Looking for a fun idea for Mother’s Day that the kids will love helping with and Mom will love receiving? 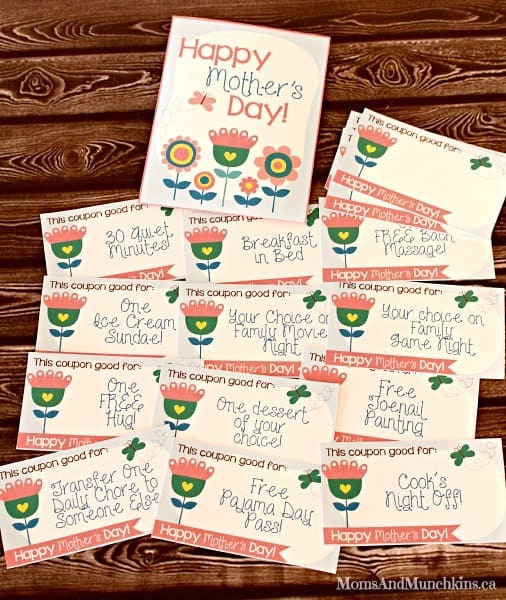 Then you’ll love these free Mother’s Day coupons! It’s a gift that just keeps on giving as Mom cashes in her special coupons throughout the year. This is a gift that the entire family can enjoy. Be sure to visit our special Mother’s Day page for even more fun ideas! 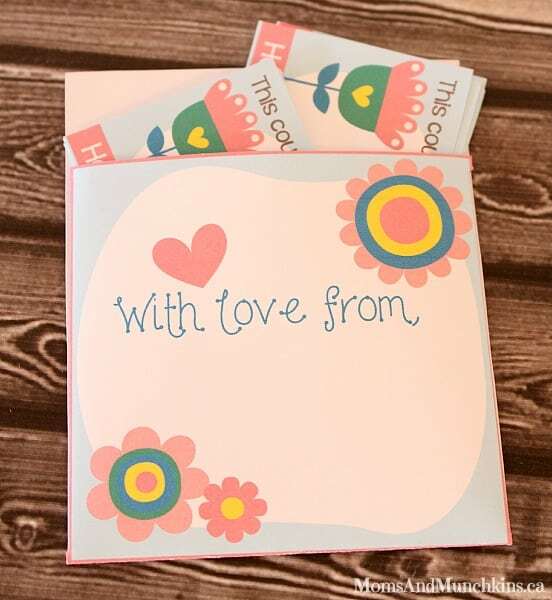 Simply print out the free Mother’s Day coupons along with the envelope. Cut out the coupons, put them into the special envelope and sign your name on the envelope. …plus blank coupons to write down a few of your own ideas! These free Mother’s Day coupons are exclusive to Moms & Munchkins newsletter subscribers. You can sign up for free here. Once you sign up, you’ll be directed to a link for the freebies page along with the secret password where you’ll have access to all of the free newsletter printables on Moms & Munchkins. This free Mother’s Day Coupons set is under the May 2014 heading. We’d like to send a big thank you to Denise of The CreativiDee Workshop for creating these free printables for us. Denise is the creative genius behind all of our monthly newsletter freebies. Be sure to visit her site for even more freebies for family fun, organization and more. Don’t forget to visit our Mother’s Day page for more freebies & family fun ideas. For even more family fun ideas & free printables, be sure to follow us on Facebook, Twitter, Pinterest, Google + and Bloglovin’. Love the printables! Found you via Family Fun Friday link up. Pinned it! Hi Rashelle! After you sign up for the newsletter (the link is included above), you are directed to a page with a link to the freebies plus the password. If you’re having trouble accessing that page, please let me know. Thank you! I could not get this to work, I did sign up for the newsletter! Please help!!! Hi Ryan! I’ve sent you an email. Please let me know if you haven’t received it. Hi Carrie! After you’ve confirmed your email address for the newsletter, you should be directed to a Thank You page with a link to the freebies and the password. I’ve sent you an email – please let me know if you don’t receive it. Thank you! Hi Megan! I’ve sent you an email – please let me know if you didn’t receive it. I got access by going back to the sign up page and reentering my email. It then came up with the link and password. Hello! Glad you were able to figure it out. Let me know if I can help you with anything else. Hi Anne! I’ve sent you an email – please let me know if you haven’t received it. Hi Clay! I just tried to send you an email but it’s coming back as undeliverable. Did you receive a link to the freebies page with the password? I think I figured it out – I was clicking on the image rather than the link under the picture – THANKS! I can’t seem to find where to print the coupons? Nevermind! Thanks to the comment thread, I found it! How do I even print this…there’s no button????? Hello! There is a link above to click to sign up for the free newsletter. Once you’d subscribed, you’ll be redirected to a page with a link to the freebies and the password. Let me know if you have any troubles. Hello! I’ve sent you an email with the link. Please let me know if you don’t receive the email. It’s Ok. I ended up using another coupon, Thank You. Hi there! I sent you an email a few weeks ago but I forgot to reply here. Please let me know if you didn’t receive the email. Thanks! I would love to access this but I can’t get to the page any longer as I didn’t click on the correct link after signing up for the newsletter. Can anyone help? Hi Josephine! I’ve sent you an email. Please let me know if you didn’t receive it. Hi Kendra! I’ve sent you an email (back on May 1st). Please let me know if you didn’t receive it. Thanks! Hi Evette! I’ve sent you an email. Please let me know if you don’t receive it. Hi Vicki! I sent you an email – please let me know if you didn’t receive it. Please send me the link. I keep returning to the same subscription page after I receive the password from my email.